WILLEMSTAD — MFK-leader and Premier Gerrit Schotte lied when he announced in the States that his predecessor Emily de Jongh-Elhage (PAR) concluded an agreement with the University of Texas without an authorization decision. De Jongh-Elhage stated this during a press conference of her party yesterday, where she presented the authorization decision in question that was signed by Governor Frits Goedgedrag and herself. The press conference from the PAR was convened to lash out at Schotte, who had accused De Jongh-Elhage and her predecessor of illegal actions and misinforming the national parliament earlier this week in a public States meeting. Just as her predecessor had done several days ago, De Jongh-Elhage rejected all accusations yesterday. The former premier accused Schotte of having brought the institute of premier of Curaçao in discredit by launching false accusations during a States meeting. The PAR-leader explained once again yesterday that no authorization decisions were drawn up for the contracts concluded with Repsol and Murphy’s because it regards perusal of data well over thirty years. These contracts would not bind the country to anything financially or legally. The contract with the University of Texas was a different matter, because it regarded a research involving expenses. For this purpose, an authorization decision was required and that was signed too, according to De Jongh-Elhage yesterday. ORANGE CITY - The Government Office this morning was an agreement in principle between the Aruban government and oil refinery Valero signed for gas supplies from the refinery in San Nicolas. Delivery is based on the purchase of a private ship liquefied natural gas to the island will bring to WEB and Valero. Addition, we are a direct pipeline between Venezuela and Aruba. In the signed agreement in principle, the possibility Utilities NV, parent company of both water and power producer WEB and Elmar electricity supplier, to join in this joint venture. Valero is working on making a switch from oil to liquefied natural gas as fuel for the refinery. It should not only ensure lower costs for the refinery but also the production of utilities will, especially through this agreement are lower. Eman expects the transition of gas production by WEB WEB between 15 and 20 percent will fall. Recipe WEB-generators can all run on gas. Valero will for the change, which is already being prepared for a bigger profit margin concerns. The prime minister assures the continuity of production and thus the presence of Valero on the island. Dec. 13 (Bloomberg) -- Valero Energy Corp. plans to begin the restart of its Aruba oil refinery “within the next several days,” the company said in an e-mailed statement. Valero shut the plant indefinitely on Aug. 26, 2009, after it lost money in the second quarter of that year. Since then, the company has overhauled the refinery to prepare for a restart if margins improved and to make it more attractive to buyers. “The startup process will begin on selected refinery units and will continue through December, with the expectation that all refinery units will be operating fully by the end of January,” Valero said in the statement. Valero, which announced the sale of two of its 17 North American refineries this year, is seeking a buyer for Aruba. The 235,000-barrel-a-day refinery, third largest in the Caribbean, has been for sale for more than three years. Bill Day, a spokesman for San Antonio-based Valero, said in an e-mail Dec. 10 that it will be an advantage “having Aruba making intermediates while we have Gulf Coast units in turnarounds” in the first quarter. The Aruba refinery can produce distillate fuel, intermediate feedstocks and blending components for the U.S., South American and European markets. The plant, which can process lower-cost heavy, high-sulfur crude oil, was a supplier to Valero’s seven other Gulf Coast refineries. Valero, along with the government of Aruba, also announced that they had signed a memorandum of understanding addressing the delivery of a liquefied natural gas to Aruba, “which will help reduce utility costs and lower emissions on the island,” according to the release. The largest plants in the region are the Hovensa refinery in the Virgin Islands, a joint venture between Petroleos de Venezuela SA and Hess Corp., followed by the Isla plant in the Netherlands Antilles operated by PDVSA. Heavy, sour Maya crude from Mexico, the kind the Aruba plant processes, was worth $9.49 a barrel less than light, sweet West Texas Intermediate oil as of Dec. 10, according to data compiled by Bloomberg. That compares with a discount of $4.89 a barrel on Aug. 3, 2009. Plants that process heavy, sour crudes can be more profitable as the discounts for those grades widen. The premium of heating oil over crude oil, or crack spread, based on January contracts, was $15.43 a barrel as of Dec. 10 on the New York Mercantile Exchange. Heating oil is traded as a surrogate for other distillates, including diesel. Valero is the largest of the U.S. independent oil refiners, companies without oil or natural gas production. Its 15 North American plants can process more than 2.8 million barrels of oil a day. The company sold its refinery in Delaware to PBF Energy Co. LLC, the partnership backed by private-equity firms Blackstone Group LP and First Reserve Corp. Valero in September agreed to sell its Paulsboro, New Jersey, refinery, also to PBF. Valero fell 15 cents, or 0.7 percent, $21.47 at 12:39 p.m. in New York Stock Exchange composite trading. Officials with the Valero Aruba Refinery and the Government of Aruba announced today that they had signed a memorandum of understanding addressing the delivery of a liquefied natural gas to Aruba, which will help reduce utility costs and lower emissions on the island. Valero has spent more than $90 million so far getting the refinery ready to operate. The restart comes nearly 18 months after it was shut down in July 2009 for economic reasons and uncertainty in the tax regime going forward. The restart was supported in part by the settlement agreement reached with the Government of Aruba and approved by the Parliament of Aruba last May. Throughout the shutdown, employees remained on the payrolls, and in June 2010, Valero announced that the tax settlement along with an improved economy had made it possible to consider restarting the refinery. A plantwide “turnaround,” or thorough maintenance period, was begun shortly afterward. Now that the turnaround work has been completed, Valero has determined that market conditions support the refinery’s operation. Valero Energy Corporation is an international manufacturer and marketer of transportation fuels, other petrochemical products and power. Its assets include 15 petroleum refineries with a combined throughput capacity of approximately 2.8 million barrels per day, 10 ethanol plants with a combined production capacity of 1.1 billion gallons per year, and a 50-megawatt wind farm. Valero is also one of the largest retail operators with approximately 5,800 retail and branded wholesale outlets in the United States, Canada and the Caribbean under the Valero, Diamond Shamrock, Shamrock, Ultramar and Beacon brands. Based in San Antonio, Valero is a Fortune 500 company with approximately 21,000 employees. Please visit www.valero.com for more information. TM posted another source of this, yesterday. ORANJESTAD, Aruba — Valero Energy Corp. says it is restarting its Aruba refinery, which has been idle for a year and a half. The San Antonio, Texas-based company shut its Aruba refinery in July 2009 as falling prices for its refined products made the plant less profitable. The refinery had a capacity of about 275,000 barrels a day. Valero’s executive vice president Kim Bowers said in a Monday statement that the refinery "will soon be in operation." The restart process will begin within days and all refinery units are expected to be operating by the end of January. Aruba and Valero have also signed a memorandum of understanding regarding the delivery of a liquefied natural gas to the Caribbean island, which will help reduce utility costs. Valero Energy intends to reopen its 235,000-barrel-per-day refinery in Aruba within days and expects it to be at peak operation by January's end. "The restart was supported in part by the settlement agreement reached with the government of Aruba and approved by the parliament of Aruba last May," the company said. Valero has spent more than $90 million to improve the refinery. oranjestad – monday ultimo, gobierno of aruba together cu valero owing to anuncia one proyecto of instalacion of one plant of gas natural. during the first phase of introduccion of the proyecto important here, the suministro of gas will wordo haci via barco cu is carga lng; y after will being instala one pipe submarino for of the costanan of estado falcon (venezuela) till at aruba. 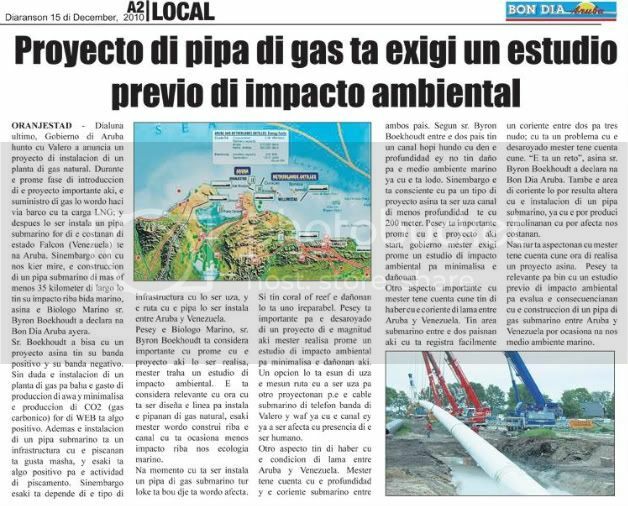 sinembargo con cu we wanted mire, the construccion of one pipe submarino of more or less 35 kilometer of largo will have his impacto on life marino, so the biologo marino sr. byron boekhoudt owing to declara at good morning aruba yesterday. sr. boekhoudt owing to tell cu one proyecto so have his near positive y his near negative. without dada the instalacion of one plant of gas for descend the gasto of produccion of water y minimalisa the produccion of co2 (gas carbonico) for of web is algo positive. besides the instalacion of one pipe submarino is one infrastructura cu the piscanan likes very, y this is algo positive for her actividad of piscamento. sinembargo this is depende of the type of infrastructura cu will being employ, y the ruta cu the pipe will being instala among aruba y venezuela. pesey the biologo marino, sr. byron boekhoudt is considera important cu first cu the proyecto here will being realisa, have to work one study of impoacto ambiental. the is considera relevante cu hour cu is being disena the linea for instala the pipanan of gas natural, this have to wordo construi on the canal cu is ocasiona less impacto on we ecologia marino. at instant cu is being instala one pipe of gas submarino all thing is under dje is wordo afecta. without have coral or reef the danonan will is uno ireparabel. pesey is important for her desaroyado of one proyecto of the magnitud here have to realisa first one study of impacto ambiental for minimalisa the danonan here. one opcion will is esun of employ the same ruta cu the being employ for another proyestonan therefore.e the cable submarino of telephone near of valero y platform already cu the canal ey already owing to being afecta cu presencia of the being human. another aspecto have of haber cu the condicion of lama among aruba y venezuela. have to as cuenta cu the profundidad y the coriente submarino among both country. according sr. byron boekhoudt among the two country have one canal much hundo cu in the profundidad ey not have dano for her medio ambiente marino already cu the is mud. sinembargo the is consciente cu for one type of proyecto so is being employ canal of less profundidad till cu 200 metre. pesey is important first cu the proyecto here start, govierno have to exigi first one study of impacto ambiental for minimalisa the danonan. another aspecto important cu have to as cuenta cune have of haber cu the coriente of lama among aruba y venezuela. have area submarino among the two paisnan here cu is registra facilmente one coriente among two for three nudo; cu is one problem cu the desaroyado have to teme cuenta cune. “e is one reto”, so sr. byron boekhoudt owing to declara at good morning aruba. also the area of coriente will can resulta altera cu the instalacion of one pipe submarino, already cu the can produci remolinanan cu can afecta we costanan. ORANJESTAD — The Dutch Gas Union is interested in participating with the supply of liquid gas to Valero and to water and energy company WEB. Premier Mike Eman (AVP) said this yesterday after signing the basic agreement between the government and oil refinery Valero for the supply of liquid gas to the refinery and to utility company WEB. Both Valero and WEB are switching to liquid gas as fuel. This should yield Valero a substantial profit margin. For WEB, the switchover should lead to a 15-20 percent cost reduction. In any case, Aruba and Valero will be purchasing a vessel to transport the liquid gas to the island. In addition, parties will research whether a gas pipeline from oil company PdVSA could be laid between Venezuela and Aruba. To this end, an agreement was concluded with the Venezuelan Minister of Foreign Affairs, Nicolás Maduro last July in the presence of former Dutch Minister of Foreign Affairs, Maxime Verhagen (CDA). During the press conference, the Premier did not indicate with which of the two projects the Dutch Gas Union would be participating. Nevertheless, it’s obvious the Premier is pleased with the company’s interest. “Partners, such as Valero and the Dutch Gas Union, guarantee us the synergy we seek for our country,” he says. The Dutch Gas Union will arrange the transport of the Dutch natural gas through an extensive gas network in the Netherlands and the northern part of Germany. The Dutch government has complete ownership of the aforementioned and is the owner and manager of one of the largest gas pipeline networks in Europe. ORANGE CITY - The interest of the Dutch Gasunie's participation in the activities of oil company Valero Aruba and in the field of natural gas, is still premature. It says the Minister of Finance, Utilities, Energy and Communications, Mike Meza (AVP). The second largest gas supplier to Europe, exploratory talks with the island for the possible provision of expertise. Daily Herald reported on December 14 that Prime Minister Mike Eman (AVP) during the announcement of the reopening of Valero and cooperation between the government and the oil company to work together on the supply of gas, announced that the Dutch Gasunie has ordered Aruba's activities in the field of natural gas. But according to De Meza 'we're not that far. " "Gasunie has agreed to a number of conversations with us. Now they've got some information next week and find some teleconferencing. "That the Dutch Gasunie is a state, it also plays a role in accessing the company said. "So that way you get the ties with the Kingdom." Within eighteen months, both as water and energy Valero WEB fully throttle, said Mr De Meza. Not only does this create a bigger profit margin for the refinery, the production of WEB will result 15 to 20 percent lower. The contact with the gas from the Netherlands and a part of Germany was founded by the Dutch energy envoy Jan-Meinte Postma, also on behalf of Valero Aruba approaching potential partners. Goal is still providing expertise, albeit in delivering gas and utility Valero WEB through a ship, helping with a possible gas line between Venezuela and Aruba or searching for gas on the seabed in Aruban waters. In which of the three projects Gasunie will participate, according to De Meza is far from clear. ORANJESTAD — The Dutch Gas Union’s interest in participating with the activities of Aruba and oil company Valero in the field of natural gas is still premature, says the Minister of Finances, Utilities, Communication and Energy, Mike de Meza (AVP). The second largest gas supplier of Europe will be having exploratory talks with the island to provide expertise if so desired. On December 14th, the Amigoe reported that during the announcement of Valero’s re-opening and the cooperation between the government and the oil company for joint gas supply, Minister-President Mike Eman (AVP) stated the Dutch Gas Union had shown interest in the activities of Aruba in the field of natural gas. However, according to De Meza ‘we haven’t reached that stage yet’. “Gas Union had expressed their willingness to hold several conversations with us. Now that they have received some information, several teleconferences will be held next week.” The fact that the Gas Union is a state-owned Dutch company also plays a role in approaching the company, according to the Minister. “This will also strengthen the ties with the Kingdom.” Within eighteen months, both Valero and water & electricity company WEB will have to operate entirely on gas, according to Minister De Meza. This must not only yield the refinery a good profit margin, but also lower WEB’s production costs with 15-20 percent. The Dutch energy giant Jan-Meinte Postma – who is also to approach potential partners for Valero on behalf of Aruba, had arranged the contact with the gas supplier of the whole Netherlands and a part of Germany. For the time being, the aim is to provide expertise with supplying gas to Valero and utility company WEB by means of a vessel, assisting with a possible gas pipeline between Venezuela and Aruba, or finding gas on the sea-floor in Aruban waters. In which of the three projects the Gas Union will be participating, is far from clear, according to De Meza. SUGAR LAND, TX--(Marketwire - January 11, 2011) - Researched by Industrial Info Resources (Sugar Land, Texas) -- Valero Energy Corporation (NYSE:VLO) (San Antonio, Texas) is planning to restart the company's Aruba refinery within the next week following a lengthy shutdown. Valero, which purchased the refinery in 2004, chose to shut it down on July 16 of last year due to poor refining margins, but left the refinery on standby in case a restart was required. For details, view the entire article by subscribing to Industrial Info's Premium Industry News at http://www.industrialinfo.com/showNews.jsp?newsitemID=171773, or browse other breaking industrial news stories at www.industrialinfo.com. Industrial Info Resources (IIR) is the leading provider of global market intelligence specializing in the industrial process, heavy manufacturing and energy markets. IIR's quality-assurance philosophy, the Living Forward Reporting Principle™, provides up-to-the-minute intelligence on what's happening now, while constantly keeping track of future opportunities. For more information, send inquiries to refininggroup@industrialinfo.com or visit us online at www.industrialinfo.com. Wednesday, 16 February 2011 5:11 p.m.
ORANGE CITY - The Dutch Gasunie is interested in participating in the supply and distribution of natural gas in Aruba. Within a month, a group of experts from the gas supplier to Aruba to investigate the possibilities. Three weeks ago, were two representatives of the second largest gas supplier to Europe exploratory talks with Valero, and Utilities WEB SA, says Freddy Rafini, policy officer of Utilities NV. "Gasunie to Aruba due to the Prime Minister has good contacts with the Netherlands. We are still at a very early stage, but Gasunie sees opportunities in the storage of liquid gas that is purchased and the construction of a tube between Valero and WEB. They come to Aruba to examine their potential. " Valero and in December the government signed an agreement in principle for the joint care of both the refinery and gas supplies for water and power company WEB. This is done through a joint venture, purchasing, storage and distribution of liquefied gas will account. In principle agreement states that SA WEB and Utilities are able to participate. But Gasunie can get in as a partner. "The team that Gasunie visit, will also look at," said Rafini. The exact plans for gas supply and distribution have now taking shape. Thus, at a Valero floating reservoir where liquid gas is stored that probably once a month is provided. At the same container is also an installation that the liquid substance into a gas sales. "This system is used until the gas line from Venezuela has been realized. Then the monthly supply from Venezuela, like a sort of safety net, "said Rafini. The road to the gas line from the Venezuelan mainland is long, and apparently uncertain. "It's between three and five years before the pipeline is there. Before the pipeline is constructed to Aruba which is negotiating with both Colombia where the gas comes from, as in Venezuela where the pipe to a large extent through. "Last year in July spoke to Prime Minister Mike Eman (AVP) and the Venezuelan Foreign Minister Nicolás Maduro remaining to jointly studying the possibility of a gas pipeline from energy company PDVSA from Venezuela, Aruba and Curacao. With that goal in October, a committee. The status of this committee is still unknown. Moreover Rafini says that the exploration gas reserves on its seabed is still being investigated by the government. A. TO ENGAGE IN HYDROCARBONS EXPLORATION AND PRODUCTION AS WELL AS ANY OTHER ACTIVITIES RELATED TO THE HYDROCARBONS INDUSTRY. G. TO BORROW AND LEND OUT MONIES TO RESPECTIVE PROFESSIONAL MARKET-PARTIES, NATURAL PERSONS AND CORPORATE BODIES WHICH ARE RELATED TO THE CORPORATION BY PARTICIPATION IN ITS CAPITAL STOCK DIRECTLY OR INDIRECTLY, TO EMIT BONDS FOR MONIES RECEIVED IN LOANS AND TO GIVE SECURITY IN ANY MANNER IN FAVOR OF THIRD PARTIES. 2. THE CORPORATION MAY NOT BE ACTIVE, IN OR OUTSIDE OF ARUBA, AS A CREDIT INSTITUTION OR CREDIT ASSOCIATION, AS REFERRED TO IN THE BANK AND CREDIT SUPERVISION ACT. THE CORPORATION MAY NOT PARTICIPATE IN THE ARUBAN COMMERCIAL TRAFFIC, EXCEPT FOR THOSE TRANSACTIONS WHICH ARE NECESSARY TO HOLD AN OFFICE IN ARUBA. 3. THE CORPORATION IS AUTHORIZED TO DO ALL NECESSARY OR USEFUL FOR THE ACHIEVEMENT OF ITS OBJECTIVE, OR WHICH STANDS IN RELATIONSHIP THERETO IN THE WIDEST SENSE OF THE WORD, INCLUDING THE PARTICIPATION IN ANY OTHER ENTERPRISE OR CORPORATION, AS WELL AS THE PERFORMANCE OF ALL OTHER ACTS IN THE COMMERCIAL, INDUSTRIAL AND FINANCIAL FIELD. This was a newspaper published by the Lago Oil & Transport Co.
Maybe there are some interesting things to be found in these archives. LMAO..... Anyone have the capability to find out if these coordinates are where the persistence was? This is from many, many years ago, but I thought it would be very telling as to what they were doing if these coordinates are similar to where they were. Several wells have recently been drilled in offshore Aruba approximately 12 degrees NOrth Latitude and 70 degrees West Longitude, just north of the Westernpart of Venezuela, South Central Caribbean. One of the wells, the Oxy Chuchubi No. 1 well penetrated a largely carbonate section that ranged in age from early Pliocene to early Oligocene to late Eocene at its total depth of 9,210 feet. High resolution biostratigraphy of benthic and planktonic foraminifers and calcareous nannofossils provided the abundance and diversity histograms necessary to recognized a series of maximum flooding surface condensed sections (MSF). Fourteen maximum flooding surfaces within the MFS condensed sections were identified on the well log and dated using the planktonic foraminifers and calcareous nannofossils. These maximum flooding surfaces range in age from 4.0 Ma or possibly 36.5 Ma. The paleobathymetry varies from middle to outer neritic in the upper portion of the well to lower bathyal to abyssal in the lower portion of the well. Fourteen third order sequences and their systems tracts were identified and annotated on a well log. These sequences were correlated with the Global Cycle Chart of Hag, 1987. The sequence stratigraphy provides a means of chronostratigraphic correlation to Venezuela and provides a direct tie to the geological history and hydrocarbon potential of the area. Page created in 7.275 seconds with 20 queries.